Quote by Edward Gibbon in his 1776 book "The History of the Decline and Fall of the Roman Empire"
With the expansion of the Arabic Empire in early sixth century came the development of a new religion: Islam. The religion originated on the Arabic Peninsula under the guidance of prophet Muhammad and spread to many neighboring regions, eventually encompassing many vast empires that had previously dominated the global stage. Prophet Muhammad founded Islam in the early sixth century. Beginning in the year 613 CE, Muhammad began publically preaching his new religion and gaining many followers, especially younger men, many of whom were from highly influential families. In the year 622 CE, Muhammad began building an Islamic community in the city of Medina. Here, he wrote the Constitution of Medina, a set of guidelines for the people of the city, and as a result, established the first official Islamic state. In 630 CE, Muhammad also successfully established a Muslim city at Mecca (his birthplace) after approximately six years of war with the local, pagan-believing citizens. Muhammad went on to unite and convert the tribes of Arabia before dying at Mecca in 632 CE. With the death of Muhammad, the Islamic realm was thrown into disorder. The community was unsure who should take over for Muhammad, some believing that the person should elected based on his moral and religious characteristics, while others believed that a descendent of Muhammad could lead the Islamic people. This divide still splits the Islamic community today, with one group, the Shi‘a (10% of the Islamic population), believing in the heredity model, and another group, the Sunnis (90% of the Islamic population), believing in the election of their religious leaders. It was decided that Abu Bakr (who was not a descendent of Muhammad) would become the first Muslim Caliph, and thus began the Rashidun Empire. As Caliph, he was responsible for the political features of leadership (not religious law, as he was not the prophet) and focused on expanding the Muslim realm. Following Muhammad’s death, some of the tribes turned their backs on Islam, returning to their pagan ways. Much of Abu Bakr’s reign focused on the fight against apostasy, a battle where he was successful. Abu Bakr also began expansion outside of the Arabic Peninsula through religious crusades to the Sassanid (Persian) and Byzantine (Eastern Roman) Empires. This expansion was continued through the Rashidun Empire, eventually leading to the total conquest of both these empires. The Dome on the Rock, the first major Islamic Mosque, built on Solomon's Temple in Jerusalem. Ali, the son-in-law of Muhammad, became the first Caliph under the Umayyad Dynasty. He believed in Shi‘a Islam (heredity model), and therefore believed that the first three caliphs under the Rashidun Empire were illegitimate rulers. From 661 CE to 750 CE, the Umayyad waged many successful military campaigns and conquered vast territory, which helped to further spread the message of Islam. The empire reached as far as Constantinople, France, and China, before its military forces were forced to turn back. This dynasty was responsible for building the Dome on the Rock, one of the first mosques, in Jerusalem on Solomon's Temple. This caliphate also differed from the previous in the way that it viewed those who were newly converted. G.R. Hawting, a British scholar who studies Islam noted, “Islam [during this time] was in fact regarded as the property of the conquering aristocracy,” meaning that those from the old Arabic, aristocratic families were often favored over the converts from conquered lands. As a result, they were barred from government positions and were required to pay more in taxes. This caused resentment amongst the non-Arabs, leading to a change in power and the birth of the Abbasid Dynasty. 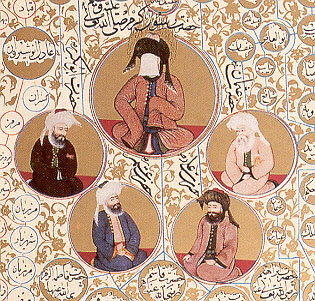 During the Abbasid Dynasty, Islam was restored to the original religion of Prophet Muhammad. At first, this empire was ruled by one powerful caliph, similar to the previous caliphates. However overtime, the Abbasid Caliphate began to grow weak, and split into different groups. In addition, a new group of people, the Mongols, began to gain power in the Middle East, and started taking over the land in the Abbasid Dynasty. This resulted in a small decline in the power and land of the Abbasid Caliphate. Map of the Abbasid Caliphate at its peak. The dark green areas represent lost land during the dynasty. As time went on, the power of the Middle Eastern region continued to change hands. With trade networks like the Silk Road, the message of Prophet Muhammad was passed all over the world, attracting many followers. As of 2009, approxmetly 1.5 billion (22%) of the world’s population is Muslim, making it the second largest religion.